The Lion and Lobster Brighton is a well known watering hole in Brighton, located near the seafront and a block away from Norfolk Square. Its multiple levels and rooftop bar make it a very popular spot among locals. 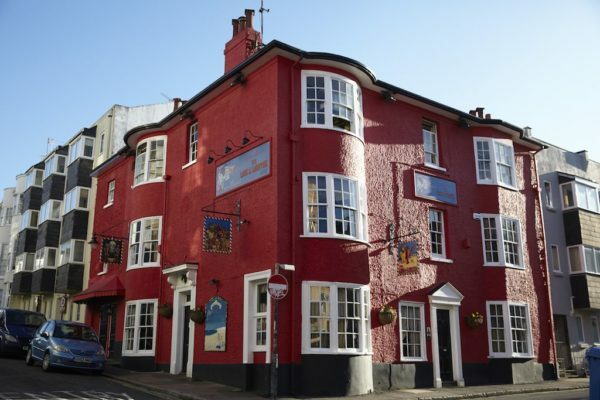 The food at the Lion and Lobster has been renowned for being among the top gastro pubs in Brighton. The restaurant upstairs takes bookings, you can always find a seat anywhere in the bar area too, but you will have to order at the bar, it won’t be table service. The ribs on the bar menu are strongly recommended! The award-winning food is prepared freshly on site using locally sourced ingredients from the best suppliers. Food is served throughout the day and they have paired the dishes with a fantastic range of wines and other drinks. On the restaurant menu you can find a great selection to choose from, there are sharing boards alongside main meals such as burgers, salads, steaks and fish. If you fancy a more informal dining experience or get a bit peckish while you’re drinking in the pub area, you can order from the bar menu which shares similar dishes to the restaurant with a few differences. So whether you’re looking for a space to meet some friends, watch live music or wine & dine, The Lion & Lobster will be a good spot to visit. A traditional pub with open fires for the Winter and a roof terrace in the Summer. Both the restaurant & bar food at The Lion & Lobster have always been good with every visit. If you’re eating in the pub area from their bar menu, I would recommend the ribs, they’re the best!